Club Penguin Cheats by Mimo777 Club Penguin Cheats by Mimo777: Club Penguin Pin Cheat - PARTY FAVORS PIN! Here is how to find the new Club Penguin PIN cheat. Step 2. Now go to the Ski Hill. Step 3. Go to the right edge. hey mimo did you know that there is a weird glitch when u try to save ur password, check it out. 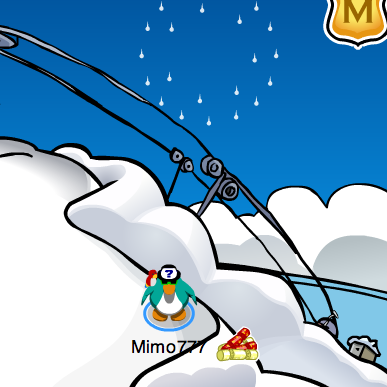 Mimo the severs like zipline have gone! They have just disapeared! om plz give credit! I like the pin too! It's a great pin! Thanks for telling us but Mimo already posted that! No worries, it's people like you who give CPG glithches that help the site become even better!Keep on searching for the glitches! Wow! That is so cool! On that note, what did you get for the "holidays"? More importantly, what did you GIVE? Hi Mahfooth! I checked it out and that is a weird glith... probabbly related with the new pop-up box they created, hopefully they squash that bug! Gee... they sure have been having many glitches lately, don't you think? Hey, that is a very cute pin! 2. Go to the 2010 yearbook and to the page for June, in the pic of the phoning facilty, click the first letter of each word (E.P.F. ), and then click on the phone in the guys hand. An EPF message will appear, and take you to the building where you can take 'the test'. P.S. I've already taken the test so things may be different from my instructions. Teh lolz, you misspelled coming in the poll. You forgot teh O. Don't think I be some nerd for saying this. You rock Mimo! Ummm... what IS a party favor? Mimo, remember the hat for the holidays which penguins can send to their friends? Well if you check it in your head items, it's NOT THERE. i like the new pin. Fjord isn't a new server. That server has been out for a while. It is not one of the new ones. i saw the BROWN PUFFLE! i was just walking around in my igloo and it popped up for like a minute in my igloo! Mimo they added back the servers they took down! Mimo, nothing to do with this but I noticed a glitch, if you try and crash your jet pack in the forest you don't get a stamp and at the end when it tells you how many coins you have it says 888 888 888 Club Penguin are glitching up a bit now! That is weird! Cp's been having many glitches lately! I think that servers been there a long time! I'm having a hard time remembering too! Me too, it is a great pin! Hooray! I love being the only penguin online on some servers so I'm happy! Good noticing, Thank you for letting Mimo know! Hey, Anonymous! I think you're seeing things, because Fjord has been there for years. LOL! Well kirsten, someone has to send you a EPF letter saying you can join. That worked for my friend.